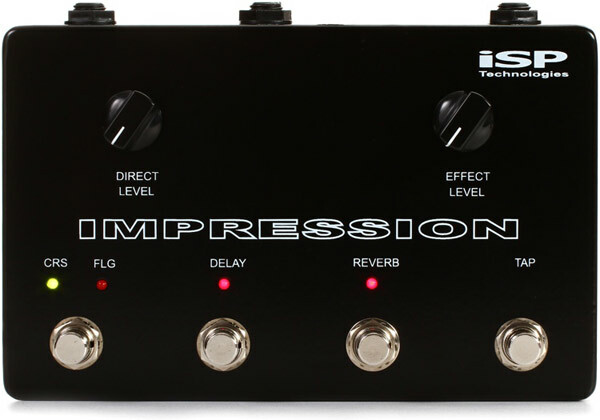 The impression pedal offers ease of use with a direct level and effects mix level. The Impression pedal can be used in a series or parallel effects loop of an amplifier or inserted in line after a guitar preamplifier or distortion pedal. The chorus / flange button will switch on and off the selected effect; holding down the chorus / flange button will change the effect from chorus to flange or flange back to chorus. Two consecutive taps on the TAP button will set the modulation rate for the chorus or flange. The delay button will turn on and off the delay effect. Holding the delay button down will change the amount of regeneration from a single delay to an increasing amount of regeneration. Two consecutive taps on the TAP button will set the delay time. The reverb button will turn the reverb effect on and off. Holding the reverb button down will change the mix of the reverb rela-tive to the level of the other effects, there are six different preset levels. This will allow the user to select the desired amount of reverb in the mix. The Impression pedal uses an external 9VAC power adaptor with an internal voltage multiplier providing professional headroom with a +/- 15 volt power supply. The Impression incorporates a mono input and left / right stereo outputs. Add the Impression pedal to your rig and enjoy the quality effects you have been searching for.